It’s going to be hard not to start this 2019 Ford Mustang versus 2019 Dodge Challenger head-to-head model comparison off with some kind of pun – something along the lines of, is the new Ford Mustang up to the challenge of besting the new Dodge Challenger lineup? 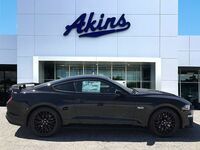 Ok, we admit that was pretty bad, so let’s quit with the kidding around and get right down to the automotive comparing. Standing in each corner of this comparison ring is a sportscar powerhouse – the 2019 Ford Mustang looking to continue the model’s streak as the best-selling sports coupe in the world, and the 2019 Dodge Challenger looking to regain some of the popularity it’s lost over the last few years. But only one will remain when it’s all said and done, so let’s find out which model that will be. The first thing most people look at when beginning their search for a new sportscar is what’s under the hood. And when that’s the case, the 2019 Mustang lineup can’t be beat. That’s because the 2019 Ford Mustang lineup features a standard horsepower rating of 310 and a standard torque rating of 350 pound-feet, whereas the 2019 Dodge Challenger lineup features a standard horsepower rating of only 305 and a standard torque rating of only 268 pound-feet. 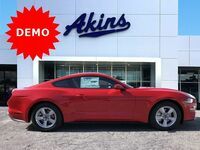 The 2019 Mustang lineup also features higher standard gas mileage ratings than the 2019 Challenger lineup – 21 city MPG and 31 highway MPG to 19 city MPG and 30 highway MPG – while also featuring a better transmission. And we saved the best for last, as you’re getting all of this with the 2019 Mustang lineup for less money than you’d pay for a 2019 Challenger. 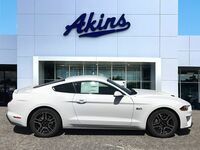 If you’d like more information on the 2019 Ford Mustang lineup, please reach out to our staff here at Akins Ford near Atlanta, GA.